Do you need an easy, delicious meal . . . fit for a king? It’s very good, but quite difficult to take a picture of. This slow cooker version creates very tender chicken and scrumptious golden sauce. If you don’t have a slow cooker, that’s o.k. You can just bake it in the oven. Like an idiot, I decided to take pictures a bit late. I have faith in you . . . you don’t need pictures! I start by placing my chicken breasts between sheets of plastic wrap. Using a mallet, pound each chicken breast to 1/4-inch thickness. If you don’t have a mallet, you can use a can of vegetables. It works great! Season each piece on both sides with salt and pepper. Place 1 cheese slice (Swiss or Provolone) and 1 ham slice on each breast. Roll up each breast (tucking loose ends in if necessary) and using a toothpick, secure the end. Dredge each in flour & shake off any excess. In a skillet, add a few tablespoons of oil and turn your heat to med/high. When the oil is hot, carefully place your chicken rolls in the skillet and brown both sides of the chicken until nice and golden brown. Note: Discard any leftover oil, but keep the nice golden bits that are in the bottom of your pan. You can add those to the sauce! Yes . . . it’s a VERY BAD BLURRY picture. Place those nice golden rolls of chicken in your slow cooker. I promise the homemade one is certainly the best. 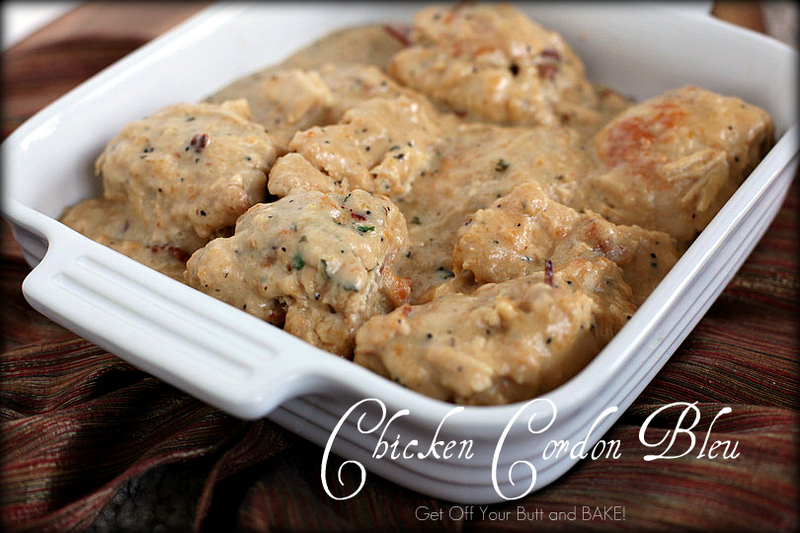 Pour it over the chicken in the slow cooker or in your 9×13 inch glass baking dish. Cover with lid or foil, and BAKE! Place chicken breasts between sheets of plastic wrap. Using a mallet, pound each chicken breast to 1/4″ thickness. If you don’t have a mallet, a can of vegetables work well. Season each piece of chicken with salt & pepper. Place 1 cheese slice and 1 ham slice on each breast. Roll up each breast (tucking loose ends in if necessary) and using a toothpick, secure the ends. Dredge each in flour & shake off any excess. In a skillet, add a few tablespoons of oil and turn your heat to med/high. 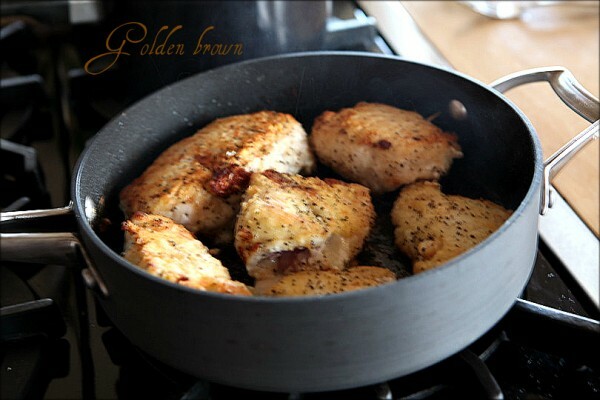 When the oil is hot, carefully place your chicken rolls in the skillet and brown both sides of the chicken until nice and golden brown. Over medium heat, melt butter and add the salt, pepper, pepper flakes, onion powder and the sugar. Whisk together. Add the flour, and stir quickly until the roux is bubbly and smooth. Add the broth, cream & milk & Continue whisking over med. heat until it has thickened – about 10 minutes. Turn heat to low! Add the grated cheeses. (Cheddar, Colby, Swiss & Parmesan) Stir well until nice and smooth and creamy. Note: I added Colby to my sauce, but placed Swiss inside the chicken. It was very good. If the sauce seems a bit too thick after all the cheese has been added, simply add a bit of chicken broth or milk and stir well. This sauce should not be as thick as pancake batter. You will want it a bit thinner. If you want additional seasonings add them now. Pour the sauce over top the browned chicken in the slow cooker and cover with a lid. CAUTION: Every slow cooker – cooks differently! When the chicken is fork tender, and falls apart easily…it is done. Note: You can also bake this in the oven: 9×13 inch glass baking dish. Cover the chicken with foil, and bake in a preheated 350 degree oven for about 60 minutes or until chicken is fork tender. Cooking time will also depend on the thickness of your chicken breast rolls. When it pulls apart easily with a fork, it’s ready and tender. Note: I don’t care for Cream of Chicken or Mushroom canned soups, but you can also use 2 cans of soup and 1 can of milk together to take the place of the homemade sauce. I thought I would leave a quick note for you to let you know my sister and I are hosting a giveaway on our blog (for cookbooks!) that we thought you might like to enter. I hope this is okay. Sure….you could fry the chicken and make the sauce at night and cook it the next day. Just wondering about a point in the directions. I never says when to add the milk, cream or chicken broth. I am assuming after you cook the roux a bit but you might want to check that since the directions are missing that point. I made this tonight and me and my fiance loved it!!! Wow…this looks so delicious. Served with homemade noodles…delicious! Just remove them before you put them in the Slow Cooker. This wil be the second time for me making this recipe. It is so easy to do and it is delicious. 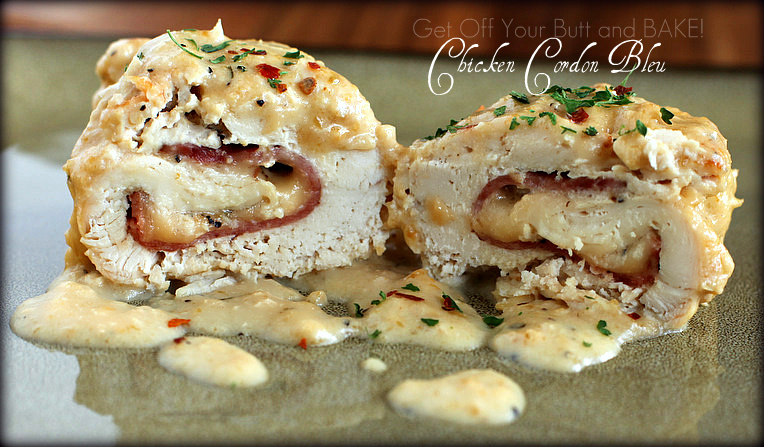 The best chicken cordon bleu recipe I’ve ever tried. Thanks for posting this!!! Well….I’m not sure. Did you dredge the chicken rolls in flour, then brown them in med/high oil? That should do the trick. You can use margarine or oil. Butter tends to burn too quickly. Hope you ate it anyway! I’m glad your guests all loved this….It’s so good and easy! I made this tonight with homemade rosemary, garlic, pepper bread, a green salad, and sauteed escarole. I didn’t have any chicken broth so I substituted white wine and added a knorr chicken boullion cube. In addition, I added a small shallot and 1 clove of garlic. I also made it in the oven instead of in a crockpot. My picky 8 and 3 year olds both ate it as did my husband who doesn’t like most chicken dishes. This is a fabulous dish and I thank you for posting the recipe. Hi Janie..The green is just parsley! Nothing fancy in this home.